I'm covered in beer, but that's OK. I just watched some of the craziest fights of my life. On Saturday, at around 5:30, my husband and I arrived at the Prudential Center in Newark, NJ to see UFC 159. Unknown to us, outside there was a whole area set up with vendors, and other things. We noticed a very large crowd around the one booth and as we got closer we noticed Fankie Edgar, a former champion signing autographs. We were too late to get in line, but we snapped a few pictures. There were several of these booths near the entrance of the arena, but one in particular caught our attention: the one with Ronda Rousey. For people who don't know, the UFC just recently started having women's fights. The first female fight was between Rousey and Liz Carmouche and Rousey won the title with that victory. We decided to go into the arena after a few more picture opportunities, and I went from a high to a low. I have a hard time going to events like this because of a severe fear of heights. (Let me explain if this way: I was a cheerleader in high school, and being one of the lightest girls, it was expected of me to be tossed in the air. Turns out I couldn't even stand on someone's knee.) On our way to our seats, I noticed we keep going up escalators and stairs and eventually we get to our section. We open the curtain to find our seats and I'm staring at the top of the big screen. After a lot of inner monologue, I convince myself to at least go sit and see how bad it is. I never moved from the seat, and it turned out that I forgot about the height as soon as the other people started filing in. It was very interesting to see how the arena filled up. The higher you looked in the arena, the more seats were filled. The people with the least expensive tickets were there for all the fights, but people who spend outrageous amounts of money for seats don't show up until the main card. Being in Jersey didn't disappoint. I went to another UFC in DC, but New Jersey is a different experience all together. Behind us were the Guidos. (I can say that. I have a ton in my family.) And these boys fit the stereotype. They were even speaking Italian most of the night. Their goal was to get drunk, and did they succeed. Before the first fight even started they had made at least 2 beer runs. That was after they sat with two in each hand. In front of us was a redneck couple who came sloshed, because they didn't want to pay for beer in the arena. While the Guidos got drunker, the rednecks got more sober. And the girl wanted to do nothing more than dance the night away...while sitting in her seat...showing no rhythm...and embarrassing her boyfriend horribly. Luckily the couple right in front of us were amateur fighters themselves. Being as my husband is also a fighter, we all were talking within in minutes of meeting. Turns out the couple actually didn't have seats there and had to moved. So there went our intelligent fight talk and the rest of the night was spent listening to people in different states of drunkenness. Not that it mattered in the long run. While my husband and I know what's technically going on, the others supplied a lot of entertainment. The Guidos definitely didn't disappoint. By the second fight they were making fun of my husband, but messing it up hilariously. They said most of the things in Italian, but the technical terms in English. So if my husband said something about a left jab, they would say left jab in English, so we knew exactly what they were doing. By the fifth fight, the worst one of the group (Why is there always the one that's the most drunk?) was calling the fighters by the wrong names. By the second to last fight, beer got spilled on us. Not just a little either, but a whole cup. That didn't matter by the end either, because UFC 159 was one the craziest I've ever seen. Before I even talk about the professional fights, let me mention the fights in the crowds. There were at least 3 that I could see from where I was sitting, but I have a feeling there were even more. I've never seen anything like it. One spawned another and then another. And the poor security, who had to jump over seats and people just to break the scuffles up. If you know fighting, you may have heard about or watched the fights on Saturday night, so you know what I mean why I say things were crazy. You can look up what happened, or probably still pay-per-view the fights, but I have to mention a few things. Two fights ended by eye poke, which rarely happens at all. Two in one night is really unusual. One fight ended when a fighter broke his thumb. (I would put that pic in, but it's brutal.) At the end of a fight, Bruce Buffer announced the wrong guy as the winner. As far as I know, that's never happened before. If that wasn't enough strangeness, the title fight may be the most bizarre. 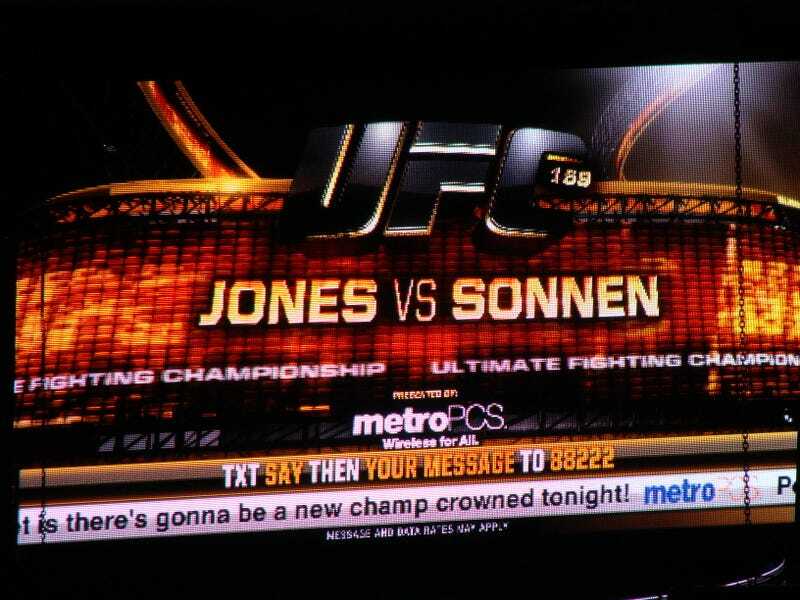 It was a quick fight between the champion Jon Jones and Chael Sonnen. Jones won in devastating fashion, but it was afterwards that things got weird. During the post-fight interview, Joe Rogan (yes, the Fear Factor guy) was talking to Jones and they noticed that the champ had broken his toe. Pretty much the second everyone realized it, the champs adrenaline went and he spent the rest of the interview on a stool, pale and grasping on to the belt as if it was holding him up. What most people didn't see on TV was eventually Jones left the arena supported by a coach, but still signing autographs and shaking hands all the way. Little differences or big ones are what make seeing things live so addicting. And Saturday night was a great live experience.